The world's third largest smart phone distributor Xiaomi has launched it's mobile phones in Nepal. Xiaomi is the emerging smartphone distributor who became the world’s most valuable technology start-up after it received US$1.1 billion funding from investors, making Xiaomi's valuation more than US$46 billion in December 2014. Mobiland Electronic Pvt.Ltd is the authorized distributor for Xiaomi Brand mobiles in Nepal. The mobile is available for purchase on online @ http://mobilandelectronic.com/ . 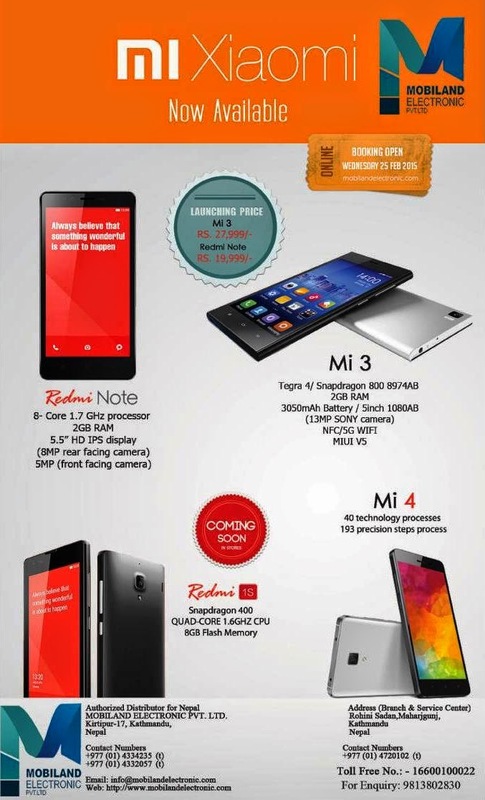 For more detail about Xiaomi mobile models and short specification please refer the image below. How can I buy Xiaomi Mi4i in Kathmandu? Have they release Mi4i in Kathmandu? How can I buy xiaomi read me note 2 in Nepal? And what's the price? Xiaomi doesn't have authorized distributor in Nepal. That is clear from the official site of Xiaomi. Mobiland is cheating Nepali consumers. They are selling fake phones. Be careful. Xiaomi mobiles have finally come to Nepal. Kaymu will exclusively launch these phones online on 15th of March. Fill in the following details to be eligible for "Early Bird" discount. do you have the spare parts too?